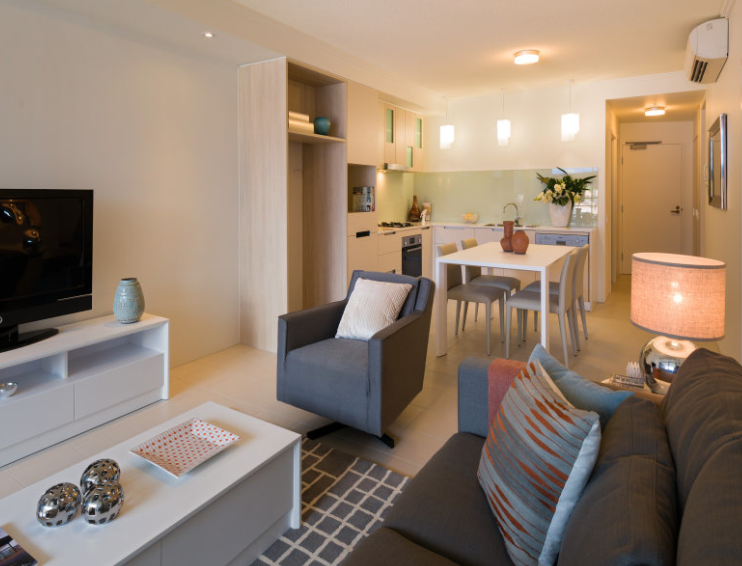 Pradella has completed two of the three buildings in its Urban Edge complex at Kelvin Grove. The "Horizons" building recently completed, and residents have moved in. The Skyview building, the third of the buildings on the site, is in early stages of construction. Horizons is an 11 storey development, with about 133 apartments. As at late May 2013, about 40 apartments were available for sale. The majority of these apartments are on the Ramsgate Street side, facing west, and not with city views. I counted 20 one bedroom apartments available for sale on this side of the building. These apartments appear to be of good quality construction. However, I don't like high-rise where the air-conditioning compressor is located on the balcony and where there are aircon headends on the walls. For a number of apartments, the kitchen is just a row of benches on the wall, and the dining area is in this kitchen space. (That is, no separate room or even an island bench-top for the kitchen.) Some of the bedrooms have very small windows.